Do you live in Key West? Key West is a city in Monroe County, Florida, United States. 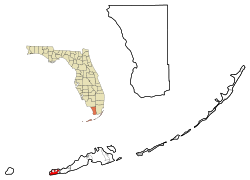 The city encompasses the island of Key West, the part of Stock Island north of U.S. 1 (the Overseas Highway) (east), Sigsbee Park (north, originally known as Dredgers Key), Fleming Key (north), andSunset Key (west, originally known as Tank Island). Both Fleming Key and Sigsbee Park are part of Naval Air Station Key West and are inaccessible by civilians. Key West is the county seat of Monroe County. Key West is the southernmost city in theContinental United States. It also contains the southern terminus of U.S. 1, State Road A1A, the East Coast Greenway and, before 1935, the Florida East Coast Railway. Key West is 129 miles (208 km) southwest (229.9 degrees) of Miami, Florida,(about 160 miles (260 km) by car) and 106 miles (171 km) north-northeast (21.2 degrees) ofHavana, Cuba.Cuba, at its closest point, is 94 statute miles (151 km) south. Key West is a seaport destination for many passenger cruise ships. The Key West International Airport provides airline service. Hotels and guest houses are available for lodging. Naval Air Station Key West is an important year round training site for naval aviation due to the superb weather conditions. It is also a reason the city was chosen as the Winter White House of President Harry S. Truman. The central business districtprimarily comprises Duval Street, and includes much of the northwest corner of the island along Whitehead, Simonton, Front, Greene, Caroline, and Eaton Streets and Truman Avenue. The official city motto is "One Human Family." Aerial photo of Key West, looking north, March 2001. Nickname(s): "The Conch Republic", "Southernmost City in the Continental United States"
Cayo Hueso (Spanish pronunciation: [ˈkaʝo ˈweso]) is the original Spanish name for the island of Key West. Spanish-speaking people today also use the term when referring to Key West. It literally means "bone cay (a low island or reef)". It is said that the island was littered with the remains (bones) of prior native inhabitants, who used the isle as a communal graveyard. This island was the westernmost Key with a reliable supply of water. In 1763, when Great Britain took control of Florida, the community of Spaniards and Native Americans were moved to Havana. Florida returned to Spanish control 20 years later, but there was no official resettlement of the island. Informally the island was used by fishermenfrom Cuba and from the British, who were later joined by others from the United States after the latter nation's independence. While claimed by Spain, no nation exercised de facto control over the community there for some time.